Posted on February 5, 2014 by Tony F.
DART performs three seasonal adjustments to route schedules to improve the reliability of bus services. Over the past year, DART has experienced growth throughout the system as a result of a redesigned and expanded network of bus routes, the opening of DART Central Station, and the introduction of new technologies for trip planning. 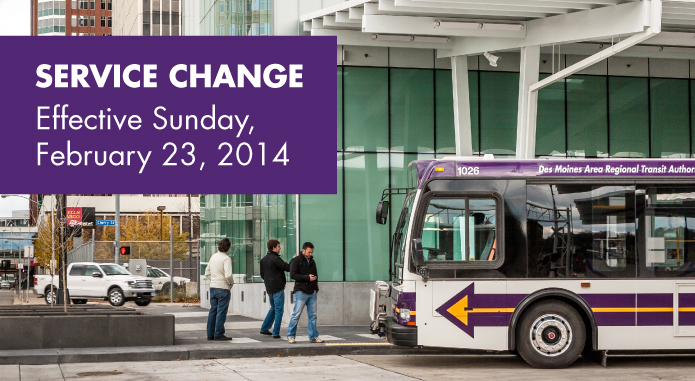 On February 23, 2014, schedule times will be adjusted on Local Routes 3, 6, 7, 14, 16, 51 and 52. Schedules will also be adjusted on Express routes 98 and 99 and on the Grimes/NW Johnston On Call Route. New schedules will be available on the buses beginning Wednesday, February 19, 2014 and are currently available at www.ridedart.com. This entry was posted in Service Changes by Tony F.. Bookmark the permalink.